SANFORD, Fla. (AP) — Jurors in the George Zimmerman trial are heading into their weekend with a lot of courtroom drama and conflicting testimony to digest. 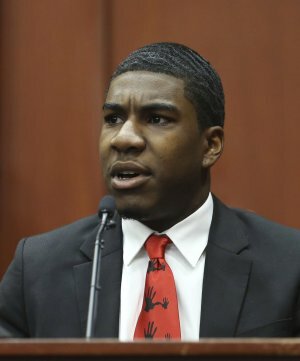 Friday's action-packed session saw the prosecution rest its case, and the judge reject a defense request to acquit Zimmerman of second-degree murder in the fatal shooting of 17-year-old Trayvon Martin last year. The mothers of both Martin and Zimmerman listened to the same 911 recording of someone screaming for help, and each said she was convinced the voice was that of her own son. The question of whose voice is on the recording could be crucial to the jury in deciding who was the aggressor in the confrontation between the neighborhood watch volunteer and the teenager. "I heard my son screaming," Martin's mother, Sybrina Fulton, said firmly after she was played a recording in which distant, high-pitched wails could be heard in the background as a Zimmerman neighbor asked a dispatcher to send police. Moments later on the call, there was a gunshot and the crying stopped. Gladys Zimmerman, though, testified she recognized the voice all too well: "My son." Asked how she could be certain, she said: "Because it's my son." Martin's half brother, 22-year-old Jahvaris Fulton, testified that the cries came from the teen. And Zimmerman's uncle, Jose Meza, said he knew it was Zimmerman's voice from "the moment I heard it. … I thought, that is George." After Friday's session was over, defense attorney Mark O'Mara told reporters "there will be a lot of other witnesses" who will testify that the voice on the call is George Zimmerman's. "But we'll just present the case," he said. "We're just getting started." Gladys Zimmerman was the defense's first witness. O'Mara said he expects to call "several" of the state's 38 witnesses back as well when trial resumes Monday, and he left open the possibility that he would try to introduce toxicology evidence showing Martin had marijuana in his system at the time he died. Judge Debra Nelson has denied the admission of that evidence for the time being. O'Mara may also call witnesses who he says have stated that Zimmerman was not a racist. Part of the prosecution's theory is that Zimmerman profiled Martin as one of the young black men he'd called law enforcement about as being possible suspects in burglaries in his townhome community weeks prior to the shooting. O'Mara said he could rest his case as soon as next week. Immediately after the state rested Friday, he asked Nelson to acquit Zimmerman, arguing that the prosecution had failed to prove its case. O'Mara said an "enormous" amount of evidence showed that Zimmerman acted in self-defense, and he argued that Zimmerman had reasonable grounds to believe he was in danger, and acted without the "ill will, hatred and spite" necessary to prove second-degree murder. But prosecutor Richard Mantei countered: "There are two people involved here. One of them is dead, and one of them is a liar." After listening to an hour and a half of arguments from both sides, Nelson refused to throw out the murder charge, saying the prosecution had presented sufficient evidence for the case to go on. 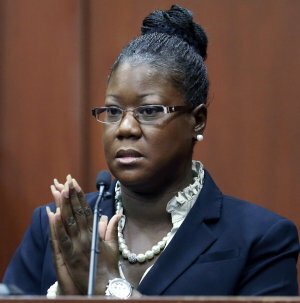 Earlier in the day, Sybrina Fulton introduced herself to the jury by describing herself as having two sons, one of whom "is in heaven." She sat expressionless on the witness stand while prosecutors played the 911 recording. "Who do you recognize that to be?" prosecutor Bernie de la Rionda asked her. "Trayvon Benjamin Martin," she replied. During cross-examination, O'Mara suggested — haltingly, in apparent recognition of the sensitivity of the questioning — that Fulton may have been influenced by others who listened to the 911 call, including relatives and her former husband. O'Mara asked Fulton hypothetically whether she would have to accept that it was Zimmerman yelling for help if the screams did not come from her son. He also asked Fulton whether she hoped Martin didn't do anything that led to his death. "I would hope for this to never have happened and he would still be here," she said. O'Mara asked Jahvaris Fulton why he told a reporter last year that he wasn't sure if the voice belonged to Martin. Jahvaris Fulton explained that he was "shocked" when he heard it. "I didn't want to believe it was him," he said. The doctor who performed an autopsy on Martin also took the stand. 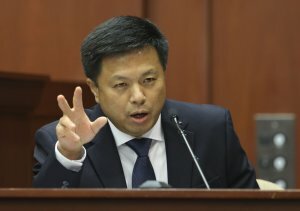 Associate Medical Examiner Shiping Bao started describing Martin as being in pain and suffering after he was shot, but defense attorneys objected and the judge directed Bao away from that line of questioning. He later estimated that Martin lived one to 10 minutes after he was shot, and said the bullet went from the front to the back of the teen's chest, piercing his heart. Follow Kyle Hightower on Twitter at http://twitter.com/khightower.